Ah Victoria’s Secret. I went to the one in Trafford Centre Manchester, the closest one to me and I spent a good half an hour spraying and sniffing each scent in the VS Fantasies body care series. 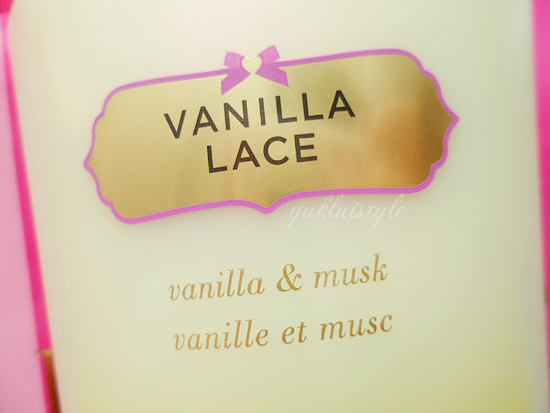 After going back and forth, the vanilla lace products is the only one I like and I love vanilla. I’ll have to try the scents in the other series. I had purchased the body mist, body wash and body lotion. This is a wonderful warm vanilla and musk scent where you would think the vanilla would smell like a cake but it doesn’t due to the musk and the other underlying notes. This is more of a floral vanilla, classy, feminine, innocent, mature scent without making you and others think of burnt vanilla desserts. It isn’t too strong or too sweet yet not too light. The body wash and lotion wasn’t as moisturising as I had hoped it to be. The wash foamed up lovely. Its scent isn’t too long lasting, quite weak actually. The lotion is thick and left my skin feeling soft and smooth but after a few hours, my skin became dry and flakey again (disgusting I know, the joys of dry skin during winter ey!). It soaks into my skin well but I would need to keep reapplying during the day. The scent lasted a lot longer than the wash. The body mist scent had lasted the longest. You can use the mist by itself and you’re sorted for the day. Using these three combined makes the scent last so much longer. I had used all three last night and could smell it when I woke up and can still slightly smell it now since it’s been more than 12 hours. They smelt different, a weird different when I had first applied but it had lightened up to that wonderful scent after a few minutes. Unsure if my nose has something to do with this. If you love vanilla scents, this is for you! I love this and would most definitely keep purchasing the body mist rather than all three but it the wash and lotion might work better on me during the summer rather than winter. With the 3 for £24 or 5 for £30 deals, you can mix and match and layer scents. It’s worth it. Have you tried any Victoria’s Secret skin and beauty range? I've still yet to buy anything from Victoria's Secret but I want some loungewear so bad. Although realistically the body care stuff is the only affordable thing in the store -_- I love the idea of the body mist so I'll have a sniff when I'm next in there! I love the VS body mists 🙂 Like you said, the scent lasts so much longer when you layer the lotion and mist. Vanilla sounds so yummy! Mmmm! I love vanilla! I'm not too big of a fan of scented bodywash or lotions but I love VS body sprays! Mmmm just reading your description of the scent makes me want to go out and start sniffing bottles of it in the middle of VS. Sounds like a perfect gourmand fragrance! Love Vanilla Lace! Vanilla/ musk smells are always my fave, always reminds me of christmas and the holidays! feels like want so sniffing the perfumed! I'm with Jade regarding this matter, only the body care products are remotely affordable in VS. Such a shame because I've heard good things about their clothing! Me and my sister love EVERYTHING vanilla. The tasteful ones of course, not the old-smelling I don't really know how to describe it haha. Oh my god, I don't think of mysielf as a vanilla lover, but if you do, please, PLEASE consider doing yourself a huge treat and favor and check out Lush Cosmetics' vanilla perfume. Also, check out their 'Mange Too' massage bar…not only is it great for massage but it's a DELICIOUS skin-softener too. nice!… added to Christmas list for the wife 🙂 Thanks for sharing! I have not tried the range, but your feature makes me want to, thanks, I love the packaging. I've never tried nor been into Victoria's Secret. I shall have to give it a go as the Vanilla Musk sounds lovely!